You are here: Home>Towns and Villages>Hemel Hempstead>Lt. 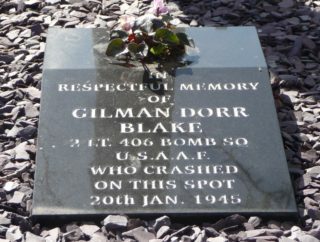 Gilman Dorr Blake, US Army Air Force. Died January 1945. On 20th January 1945, an American plane crashed after being struck by lightning. One of the airmen aboard died in Nash Mills, Hemel Hempstead. I have been trying to find out more about this man, who I believe was based at the airfield in Cheddington, and with the help of The American Battle Monuments Commission, I can now confirm his name. 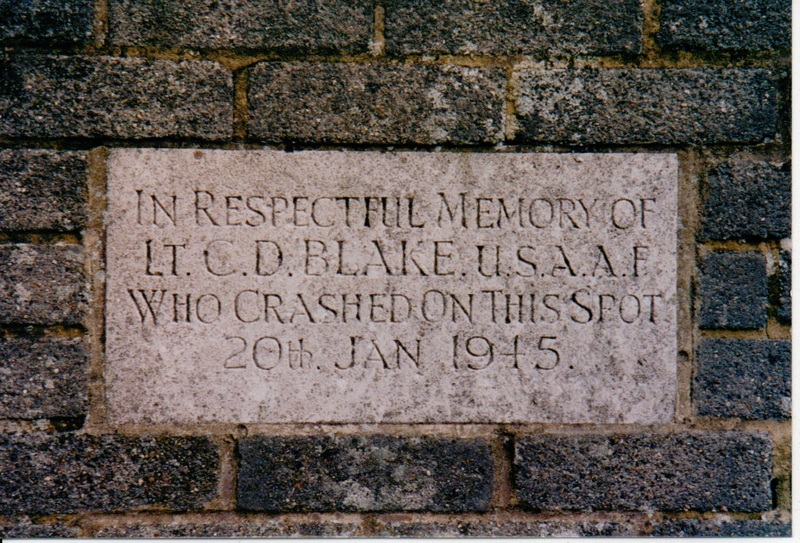 It appears that the engraving on the plaque is not quite correct, in that he was Lt. G. D. Blake, not C. D. Blake. 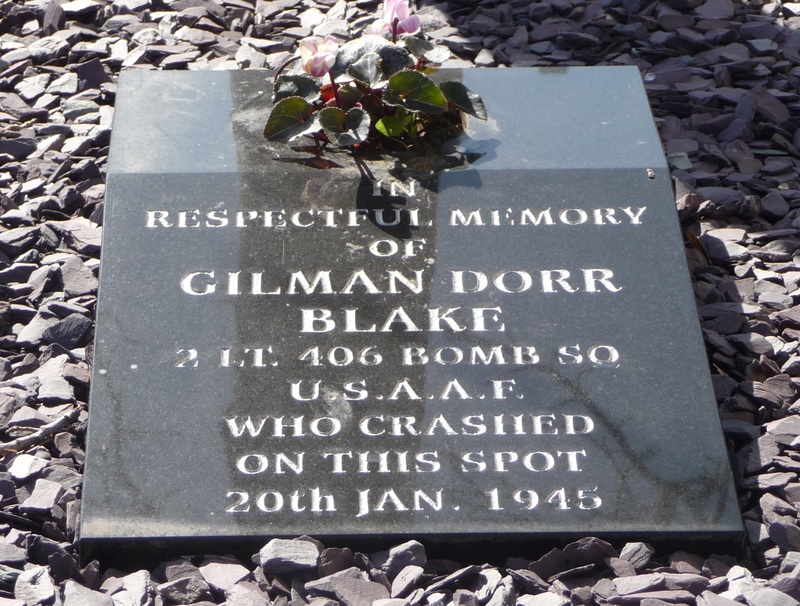 He was Gilman Dorr Blake Jr., Second Lieutenant, U. S. Army Air Forces, Service number O-828100, with the 406th Heavy Bomber (Night Leaflet) Squadron, whose job was to drop propaganda leaflets over enemy occupied territory during the night in the hope of shortening the war. Gilman Blake entered the service in New York. 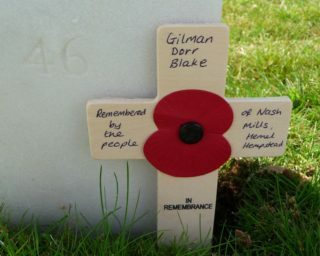 He was the son of Gilman Dorr Blake, Snr and Antoinette. His father was the Vice-President of the Central Hanover Bank & Trust Co., 70, Broadway, New York and his parents lived at 1111 Park Avenue, New York in 1942. Gilman Snr and Antoinette appear on a passenger list from 1939 with Gilman Jnr and Richard, their two sons. From this I know that Gilman Snr was born in Rockford, Illinois in 1895 and Antoinette was born in Cumberland, Montana about a year earlier. Gilman Jnr was born in New York in about 1922 and Richard’s birthplace is listed as Long Beach, New Jersey in about 1925. At the time of the passenger list, they were living at 1148, 5th Avenue, New York. They travelled on the S.S. Monarch of Bermuda from Hamilton, Bermuda on 30th March 1939 and they arrived at the Port of New York on 1st April the same year. Gilman Jnr’s age is given as 16, and his plane crashed in January 1945, so he was probably only about 23 when he died. He married Wynanda Bulkley and they had a son, Gilman Dorr Blake, 3rd. Sadly the baby was born six months after his father died. The saw mill was owned by Arthur East and Son, Timber merchants and Manufacturers. 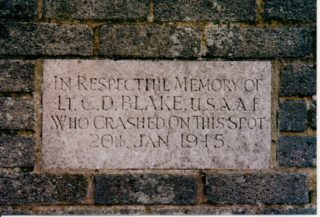 Mr. East wrote to the Blake family and asked to erect a memorial on the site. Originally, it was a placard placed on the ground. 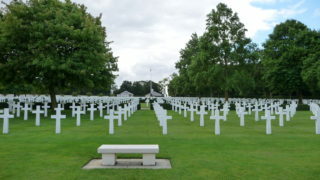 Second Lieutenant Blake was buried at the American Cemetery in Cambridge, England, Plot B, Row 1, Grave 46. 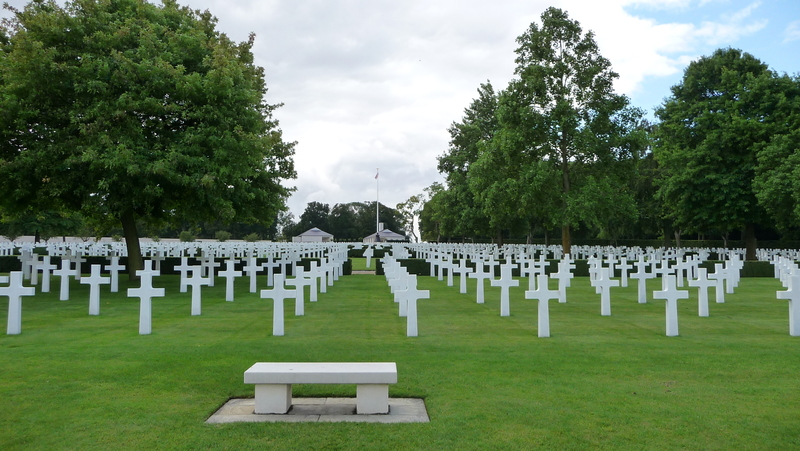 I visited the American Cemetery to pay my respects to Gilman Dorr Blake in August 2014. I am grateful to Arthur Brookes, an associate at the cemetery, who dressed the inscription on the stone with dampened sand brought from Omaha beach in Normandy for this purpose. It makes the inscription stand out and easier to read, but does not damage the stone in any way. As the sand dries out, it simply falls away. To show that he is still remembered, I left a cross by his grave with the inscription “Gilman Dorr Blake Remembered by the people of Nash Mills, Hemel Hempstead”. 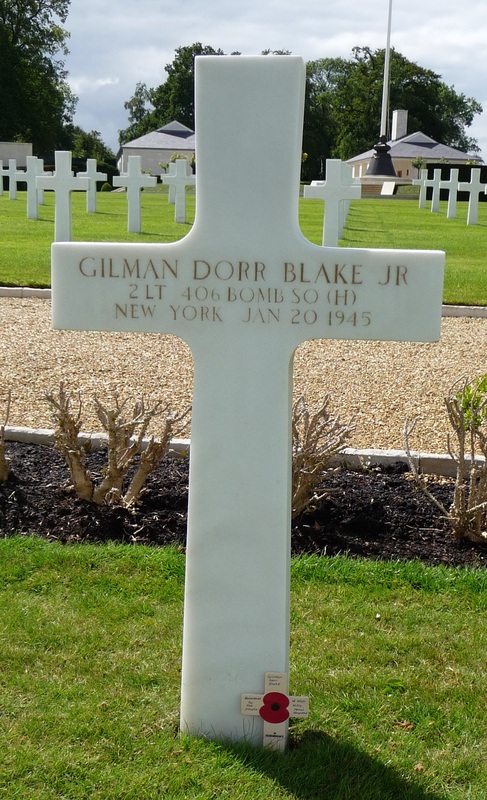 Do you know anything more about Gilman Dorr Blake, Jr.? If you think you can add more information to this story, please add a comment below. This page was added on 21/09/2011. It is very nice that Helmel remembers Gilman. I wrote “Secret Squadrons of the Eighth” – a book about Cheddington airfield and Gilman’s Squadron. If you would like to know more about him, the squadron or the airfield, please email me. Lt. Col. Earle Aber CO 406th noted in his diary 1/20/45: “Co-pilot Blake and navigator bailed. Lt. Blake was found with chute unopened”. I believe Lt. Callahan returned the plane to base. Aber also noted snow flurry conditions at the base. Thank you for keeping the memories of these men alive. They have just made memorial gardens just across from the original plaque. We went to the unveiling. Dacorum Council did him proud. We saw pictures of the plane he was in, and the children all entered a competition to draw a flying machine. My son won a prize. It was lovely to hear about some local history, and I cant believe that his relatives have found this page, that it great. I am sure Dacorum council will give you copies of the info they have! Wow, this is pretty amazing. Gilman Dorr Blake Jr. was my great-uncle: he was my paternal grandfather’s brother. I grew up hearing snippets about him (obviously my grandfather didn’t like to talk about him that much, painful subject.) A little while ago while we were clearing out my grandmother’s house in Philadelphia, I found an old photograph of him and it is amazing how much he resembles my younger brother. Anyway, I was just researching my family’s history, and it was very poignant to come across this memorial of him. Thank you so much for the putting in the time and effort to research this memorial. Thank you for sharing a layer of detail and local perspective on this significant event.